Renee grew up in Panama City, Florida and became interested in the field of physical therapy in high school after witnessing the dramatic impact physical therapy had on a close friend who nearly lost his life in a car accident. This combined with her background in dance/ballet made a career focused on restoring proper physical movement the perfect choice. Renee attended the University of Florida and graduated with her Bachelor’sdegree in Health Science in 2004 and continued her education at UF for graduate school. She was one of the first 10 students from the UF Physical Therapy program to graduate with the Doctorate degree in 2007. 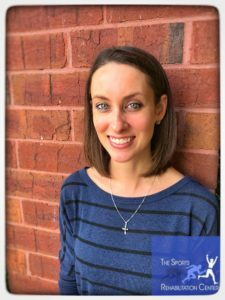 Following graduation, Renee moved to Atlanta to begin her physical therapy career, gaining extensive clinical experience in a variety of outpatient orthopedic/sports medicine settings since, as well as experience in home health PT. Renee joined the dynamic team at the Sports Rehabilitation Center in January of 2015 and currently works at the Midtown office. Her clinical interests include post-operative rehabilitation, sports related injuries, repetitive movement injuries, and restoration of postural dysfunction and enjoys constantly learning new and innovative treatment strategies. She believes in a very hands-on approach to treating her patients and has been trained through a variety of manual therapy approaches including Maitland, Institute of Physical Art, and the Manual Therapy Institute. She has been certified in advanced Trigger Point Dry needling since 2012. She is an active member of the American Physical Therapy Association (APTA), including the sports and orthopedic sections and the performing arts special interest group, as well as a member of the American Academy of Orthopedic Manual Therapy (AAOMPT). Outside of work, Renee enjoys staying active through working out, hiking and playing with her Rottweiler Bailey, cheering for her beloved Florida Gators, volunteering and exploring the city,and is an active member at her church.